One of the most interesting ecumenical sites in Romania is just a stone´s throw away from Bucharest, though far away from any civilisation or tourism circuit. An isolated, spiritual and magical place, full of history, where time seems to stand still. The cave churches and settlements of Buzau are not less than the cradle of Christianity on Romanian territory – an archaeological and cultural treasure amidst breathtaking landscape. Locals believe in the spirituality of this region, which has been used as a worship place for several thousands of years. Hundreds of legends and paranormal appearances have been reported. Even dictator Nicolae Ceausescu sent a special agent of his secret service to investigate the so-called enigma of Buzau Mountains. Today, only very few tourists visit this extraordinary region, not only due to the missing infrastructure, but also due to the widely neglected tourism promotion by local authorities. This place is unlike any other tourism destination in Romania. It is not made for hundred of buses, even off-road cars cannot access some areas. It is not made just to take some pictures and to eat some grilled meat with French fries. The journey is the reward. You can already feel it once you have left the national road between Buzau and Brasov, in the village of Patarlagele where you enter the amber region of Colti, the only place in Romania where amber was extracted. Amber is a fossil resin and estimated to be 50-60 million years old. The Romanian amber is regarded as one of the oldest in the world. Amber is said to have special healing properties and is used as talisman in many cultures. The exploitation of amber in Colti is done since time immemorial, mostly for making jewels or religious objects. The amber mine closed in 1948, but a peasant house in the centre of Colti has been transformed into an Amber Museum. An earring with an amber that preserves a three million year old ant and an amber weighing 1.8 kilograms are the pride of the place. 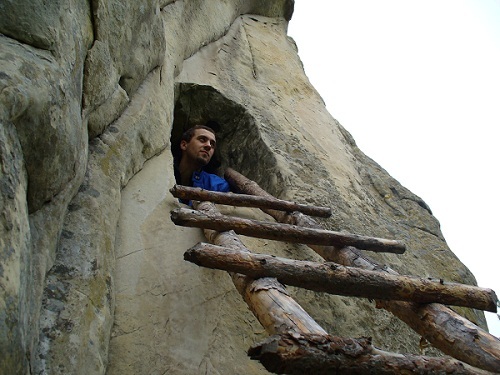 Besides a small flyer handed out at the Amber Museum, nothing indicates that you are close to one of the most spectacular religious places in Romania, that even today is full of undiscovered secrets. A small green valley with a continuing inclining road leads to Alunis, where suddenly the civilisation ends. A walking tour of about two hours is waiting for you. “Explore the Carpathian Garden” - the slogan of Romania´s brand new tourism strategy becomes reality. But somebody should tell Mrs. Udrea, the current tourism minister, that this here is Fairy Tale Romania. However, there is no tourist here, as far as the eye can see. It is clear why this region has been used as shelter, hiding place or worship place for thousands of years. More than 15 cave settlements are spread over a surface of more than 3 square kilometres and gave this region the nickname of “Athos” of Romania. 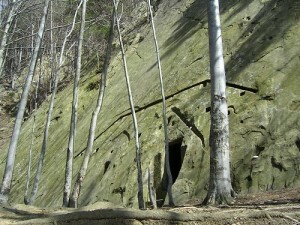 Some caves are old geological forms, others are carved or graved into the stone. One hermitage is located at the boarder of a canyon of about 10 meters. Signs of the first settlement in this area date to iron and bronze age. Probably 300 years AD, the first Christian missionaries on Romanian territory arriving from the Middle East lived here. Up to the 19 century, hermits and monks used this caves as places to live and to pray, far away from every day life. It is said that famous Romanian war lords or princesses came here to confess and to wash away their sins. Weapons, icons and crosses are painted on the walls or carved into the rock. Several inscriptions are undeciphered even today, others are just love declarations of some irresponsible tourists. The isolation of this area produced a plenty of orally transmitted legends, mystical and esoteric stories of magnetic anomaly and paranormal appearances. In fact, “Tara Luanei” – how it is called by locals - has become a famous place for esoteric fans. But even reliable sources report of many locals who swear that since their childhood they have had several appearances of monk souls striving around. There is a rumor that during the time of Ceausescu, the Romanian Secret Service sent a special agent to investigate the enigma of Buzau Mountains. But nothing is known about the results. Whool-gathering or paranormal appearances - who cares? This is definitely a place where legends can live. 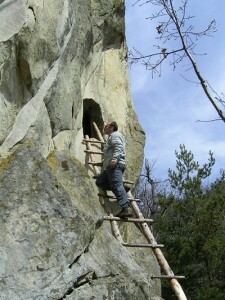 There are two access points to the cave churches and settlements of Buzau: via Colti- Alunis (DN 10 Buzau- Patarlagele) or via Bozoiru (DN 10 Buzau – Parscov).The cave churches can only be reached by walking. A good hiking equipment is recommended. It is further recommended to hire a local guide. The tourism development association of Buzau, Monteoru Renaissance organizes guided tours and weekend trips from Bucharest or Buzau to the cave churches of Alunis, Colti, Nucu, Bozioru, Cozieni and Braesti. More information on www.travelbuzau.com.